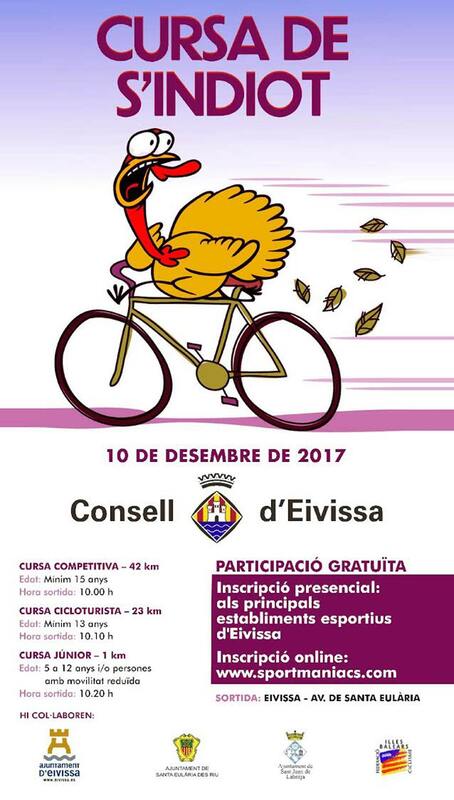 Sunday 10 December sees the 17th annual cycle races take over the Eastern roads of Ibiza. 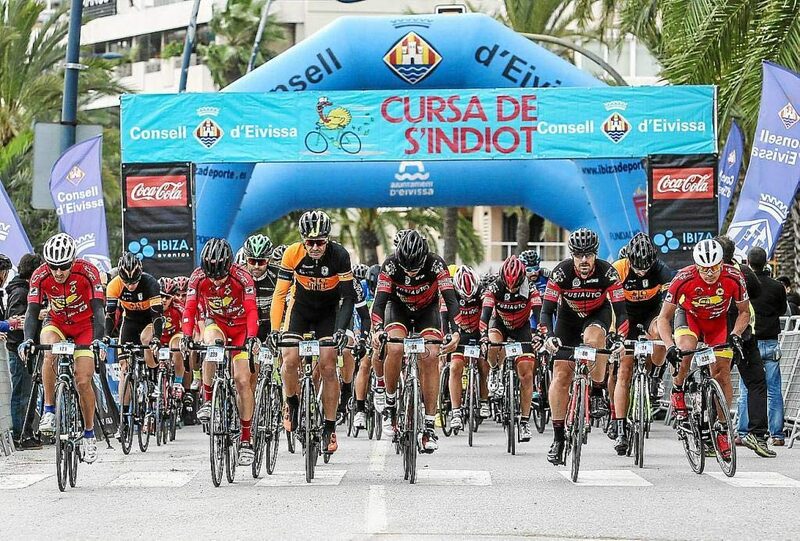 Known as the ‘cursa de s’indiot’, there are 3 races aimed at pro/competitive racing cyclists, leisure cyclists (for which there is still time to sign up), and also a race for children. The competitive race is over a distance of 43 kilometers, starting and finishing in the port of Ibiza Town. The race will start at 10 am on the Avenida de Santa Eulalia, and continue to the roundabout Ses Mines, then the road to San Carlos, across to the Morna Valley and return to Ibiza on the San Juan road. The race is limited to 220 competitors, and entries are closed as organisers already have a waiting list of 30 people. The less gruelling race is over 23 kilometers and will start 10 minutes after the professional race has departed. Entry is open to anybody over the age of 13. The emphasis is very much of participating and there is no limit on the number or ability of those who can enter. This second departure will exit Ibiza on the same route, but turn back to the San Juan road earlier, near the petrol station on the Santa Eulalia road. Finally, there will be a junior ride a kilometer away on Avenida Santa Eulalia in Ibiza, aimed at those with between 5 and 13 years, and also open to all people with reduced mobility or special needs. The race is also a popular spectator event along the route, however the biggest congregation is of course at the finish line. Registrations can be made online on the website www.sportmaniacs.com for the second and junior race. Entry numbers can be collected on Saturday 9 December, from 11 to 16 pm in the Tourist Office located opposite the Formentera ferry terminal on the harbour front of Ibiza Town. At the press conference of presentation of the race, the insular director of Youth and Sports, Fernando Gomez highlighted the good atmosphere that tends to surround this event, which have many prizes to participants thanks to donations from shops and companies. Event director, Juanjo Serra explained that there will be road closures on the route extending throughout the Santa Eulalia road from Ibiza Town to San Carlos, and the return route on the San Juan Road. He said that with careful planning it should ensure no road section is closed for more than 10 minutes at a time. That said, it may be a good idea to give the area a wide berth on Sunday morning – or better still, don’t get caught up in the traffic – join it, and sign up to enter the race.